Sharia law-loving, fake feminist Linda Sarsour parades herself around like she's a big deal. But, for those that know better, Sarsour's latest stunt doesn't make her a badass. It makes her a dumbass. Sarsour - along with other Muslim-American "leaders" - ventured out to the U.S. Capitol in Washington D.C. on Monday to protest the possible repeal of Deferred Action for Childhood Arrivals (DACA) by the Trump administration. 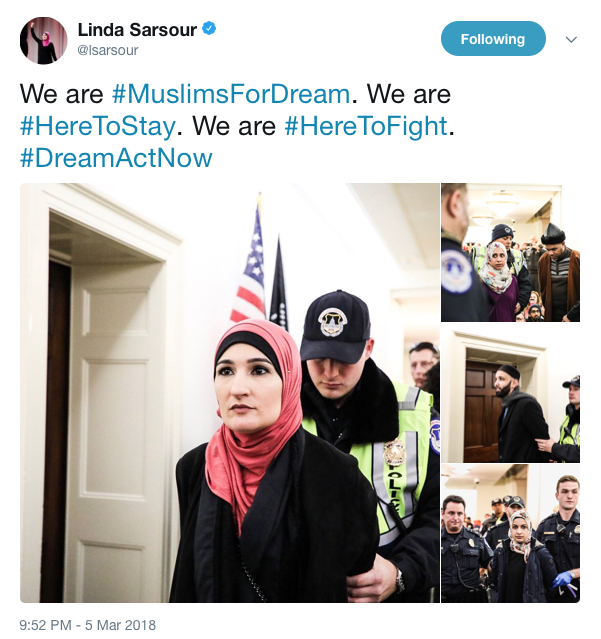 Sarsour and other protest leaders decided that it would be a good idea to go into the Capitol building and cause a stir in order to get arrested and grab some headlines. This was nothing more than a cheap publicity stunt - which people of all background and causes are guilty are of doing in the past. The Women's March organizer looks like she wasn't detained very long, because she has been very active on Twitter. Sarsour and Cyril's mother are both wrong. You shouldn't shame or "organize" people. It's the organization of people that have led the U.S. to be divided on a level that hasn't been seen in at least 50 years. Keep it up, Linda. We're not laughing with you. We're laughing at you.